It's that time of year; the stores have cleared out the Christmas stuff already and before they go crazy with Valentine's Day stuff, they've got the workout gear stacked high in anticipation of New Year's resolutions to git fit and lose weight. I'm not giving that stuff a single glance. Not that I don't need to lose weight, but I've got plenty of workout gear that's not been worn enough. Nope. What I am working on is trying to focus and make a plan for all the projects I want to work on. And boy, do I have projects. Not just quilts-in-progress, but some clothes for my daughter, organizing projects for our little cottage, other quilting related projects, blog plans, home improvement, and the list goes on. I hate that I find myself saying "I'm busy" when I've been asked how I have been. I heard a line about B.U.S.Y. standing for burdened under Satan's yoke a long time ago and it made me mindful not to cram the life of my family with too many activities that take away from enjoying one another. Did you know that multitasking can make your brain perform worse than the brain of someone who is stoned? Here's an article on what to do when you find yourself too busy. Full of good stuff. Explains why I can get overwhelmed and decide maybe my Mommy-brain just isn't all that bright anymore! Add a bit of chronic sleep deprivation and wowza! But this year, I'm working on a plan. Putting it down in writing, and working the plan. Because life doesn't always go according to plan ever, I'm also planning on extending myself some grace. I've read that putting your to-do's and projects down in writing frees up your brain to be more creative. When you try to remember it all, it's a lot like having too many tabs open in your computer's browser; slows it down. There are calendar pages taped to my wall and post-it notes galore in my studio! What are your plans for this new year? Quilty or otherwise? Anybody else eat too much pie? Recently, the concept of Ruler Work with long arm rulers on a stationary machine has had some new developments in available feet and techniques and there's increased interest here on the blog about it. I've updated the blog page above on the subject to include the new information and have decided to run the content below (with a few additions) from that page as its own post for my newer readers. Below are links to the posts I have done about using long arm rulers on a stationary machine. The machine can be a regular domestic sewing machine or one of the sit-down style long arm machines. It takes practice, but it can be done and yields some great results! Ideally, you want a foot made for use with rulers. It can be done without a ruler-type foot, but should the ruler slip under or over the foot you can break a needle and possible throw your machine out of timing. (This means the hook and needle are no longer in the right place at the right time to form a stitch.) But here's a nifty way of doing ruler work without a ruler foot that is safer than most: No Ruler Foot? No Problem! Using rulers on a stationary machine when free motion quilting is still a bit of an out-of-the-box technique and if you don't have a proper ruler foot, you may need to try some out-of-the-box thinking about the feet that are available; try different feet, different height of the foot (usually higher), a different needle position to use with a different brand's foot, etc. See the Tutorial for Using the Janome Ruler Toe on Berninas for ideas. Sit-down long arm systems have this type of foot available. The Janome 'ruler toe' is part# 767-434-005 and fits on the convertible free motion foot set for either high shank machines, low shank machines, or the 1600 convertible set. Newer, high-end Janomes come with their own version of the Convertible Free Motion Quilting Foot set, but can use the Ruler Toe from the Frame Quilting Foot set also. This blog post Tutorial for Using the Janome Ruler Toe on Berninas is the most current information on a ruler foot for Berninas. Follow it up with information on a new ruler foot from Parrs Reel Ruler. Bernina has also come out with a long arm machine which can use regular Bernina free motion feet. It is expected that the long arm's feet can also be used on regular Berninas and it has a foot for doing ruler work. No idea when it will be commonly available and it may take some creative settings adjustment unless Bernina also has some sort of software/settings adjustment. The following post on Berninas still hold true if you don't use either option given in the two posts above: Free Motion Foot and Toe Follow Up (Mostly about Berninas) Also see the link for No Ruler Foot? No Problem! I am so excited about the design potential of using free motion ruler work! You know how sometimes when working on a problem, you need fresh eyes? You just can't figure it out until you look at it with a new perspective? Well, that's happened today with ruler work. I've been trying to figure out how those of you who want to do ruler work, but don't have a proper ruler toe, can fit a ruler toe to your various machines. But I have the ruler toe, so I haven't been playing around with the usual free motion feet that are out there. I haven't been thinking about what I would do if I had no ruler toe. I have been very careful to not be overly encouraging of using your regular free motion foot with a ruler for fear of the ruler slipping under or over the foot and causing damage to your machine and needle. I'm running the ruler along the acrylic base at the bottom of the shaft of this generic hopping style foot. This is fabulous! I'm kicking myself for not thinking of this. It's much safer than running the foot along the thin rim of a regular free motion foot. I gave it a whirl under my open toe hopping foot and while it got hung up with some of the hops, it certainly was in no danger of breaking a needle or taking out the timing of my machine. I found that slightly rocking the ruler by merit of the resistance strip down the middle away from the foot helped (pressing down more on the right side of the ruler). Here you can see it more clearly with the needle up. This positioning certainly does have some limitations, especially in being able to move the ruler around the foot as needed and is harder to judge spacing and alignment. You certainly can't use the Top Anchor rotating rulers with this method, but it should work well for simple ruler work designs. 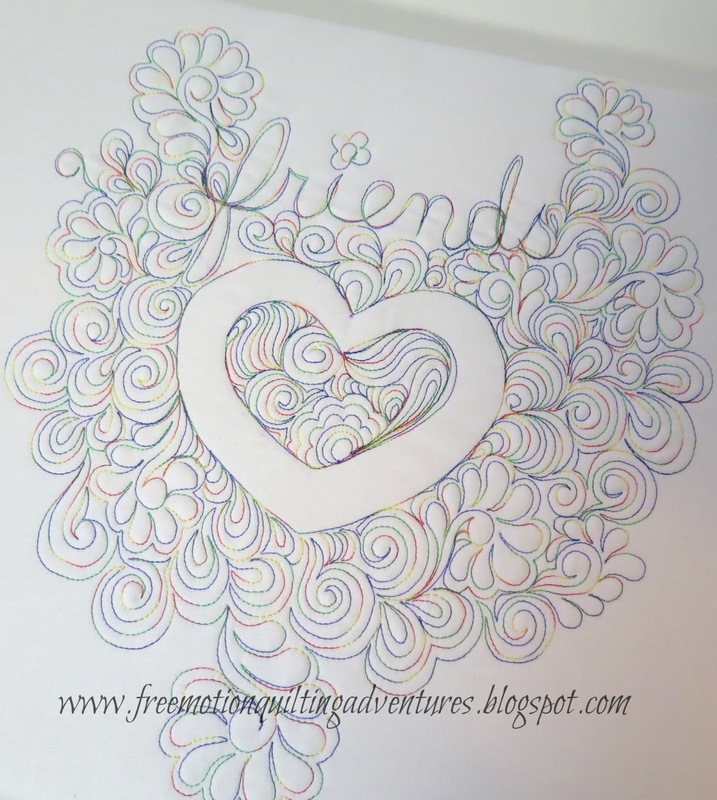 I am so happy to share with you yet another way to use rulers with free motion quilting. 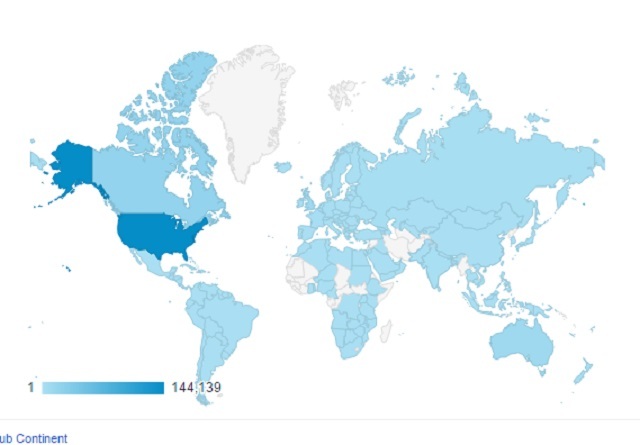 Many thanks to Marelize! 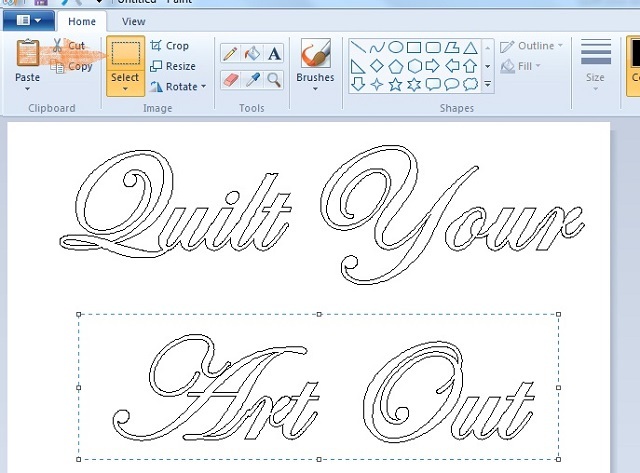 In the first part of this series, I showed you how to use Microsoft Word to make patterns for text projects. 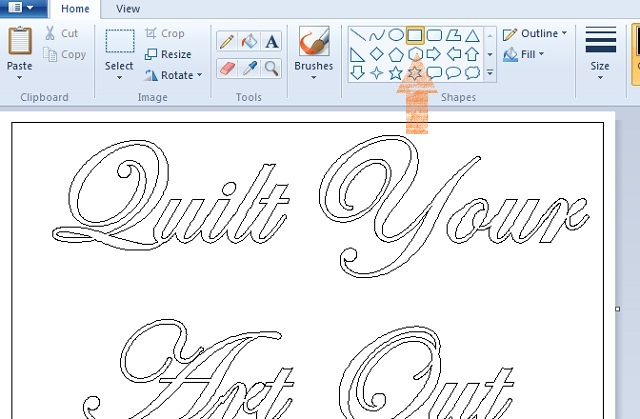 I covered how to not only get the letters or other text the font and size you want, but also how to make those huge letters in an easy to trace outline form. 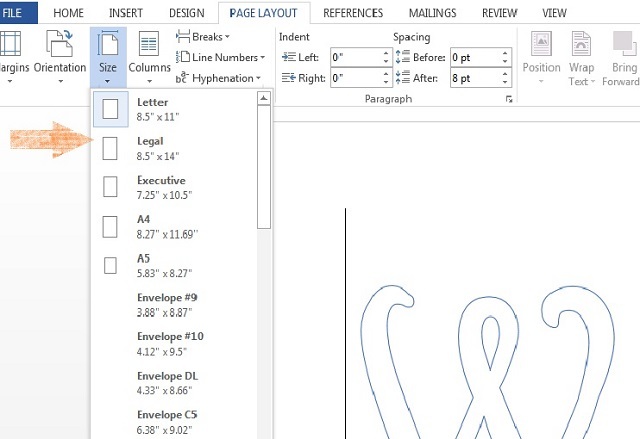 It tends to be easiest to then print out the letters and use them individually, using a scaled-down version of your text document to guide the placement and spacing. 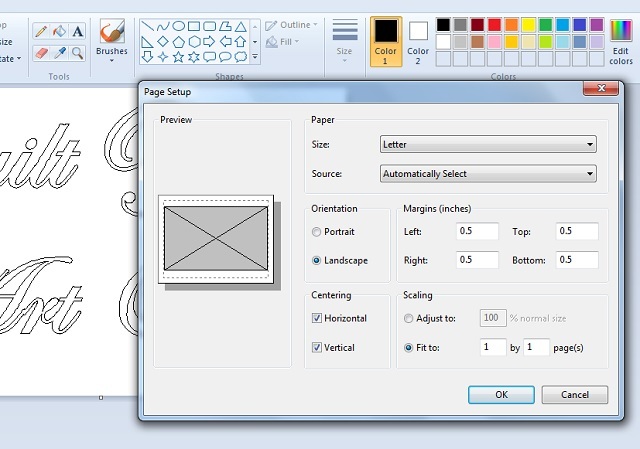 If your printer can use larger paper than standard copy paper, you can use the paper size selection menu in Paint. Sometimes a sheet of legal paper is just what you need. See below. Sometimes you want to print out your text at full size to get the full effect of the words together. If legal size won't do it, and you aren't blessed with a large format printer, this means printing on multiple sheets of standard 8.5x11 inch paper and taping the image together. First make a text document that you want to print out in a large format (Above). If you made one following the steps of Part 1 of the series, open it now. Make sure it's spaced and sized how you want it. Highlight all the text and copy it with a right mouse click. Now open MS Paint. Most PCs come with this program in the Accessories folder. Paste your text selection into it. Sometimes some odd shifting happens in the copy/paste procedure. It's pretty easy to adjust the placement of the words by selecting the words that I want to shift and then dragging them into position. Below, I shifted the bottom line slightly to the left. 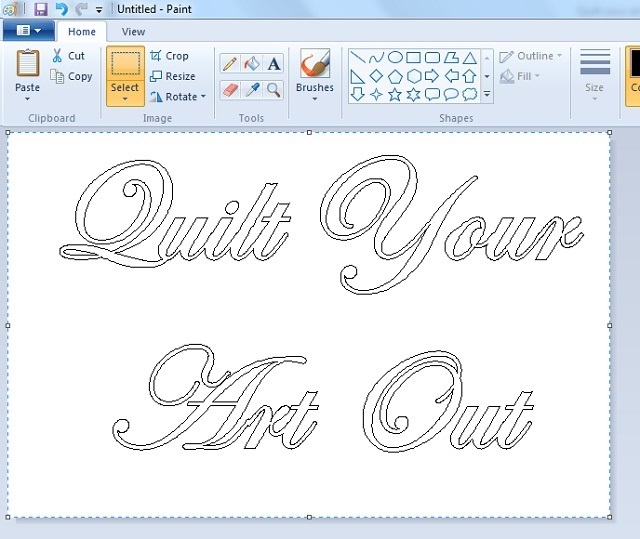 Paint does not treat the text as vector images, so don't stretch the words much to resize. 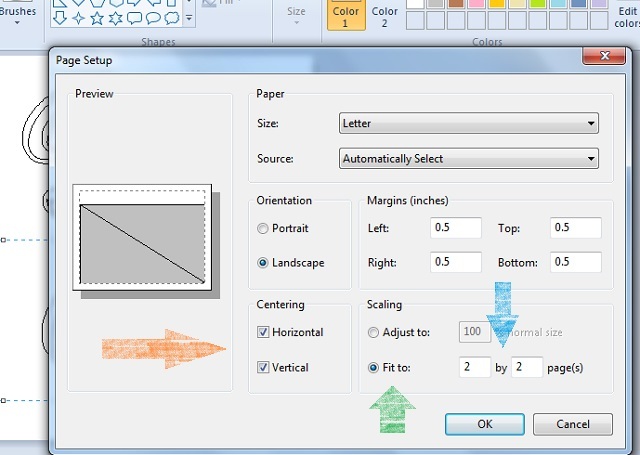 Instead use the resize option to the right of the select button for this. (Not shown) Your won't be able to specify inches or similar measurements with resizing or with Paint in general, just percent or Pixels. You have to play around with it to get it how you want it. Other programs have this feature, but again, that's for another post. It's best to get them the size you want them in the Word document before importing into Word. Since this method will print across several sheets of paper, I like to place a box around the phrase to help with centering the text on my project. It also helps with lining up the pages after they've been printed. (Above) The orange arrow points to the rectangle selection. Once you've clicked it, you can click and drag on the screen to make a perfect rectangle. In the upper right corner of the screen shot above is the line size button. I make it the thinnest. Once you've got the image and text how you want them, it's time to set up the page. Click the blue tab indicated by the orange arrow. On the drop down list, hover over the Print button as indicated by the green arrow. Don't worry, it won't start printing at this point. 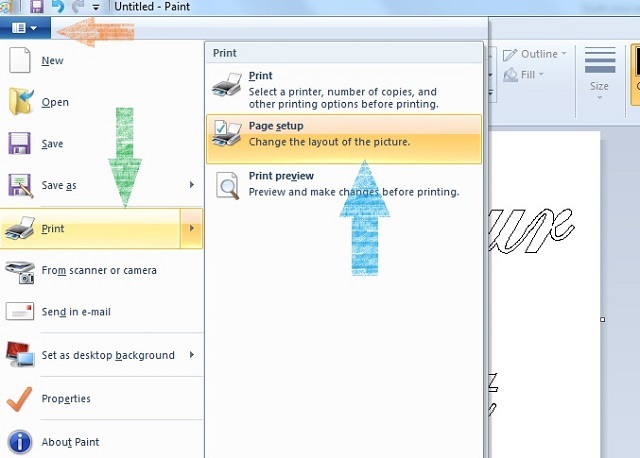 This brings up a sub-menu (you can also click on the little arrow to the right of the Print button. Go to Page Setup as indicated by the blue arrow. The dialog box below will pop up. Much of this is pretty straight forward. Chose the size of paper you will be using and decide between portrait or landscape. Don't bother with margins. The bottom portion is where we will get this document nice and big. Choose whether to center the text horizontally or vertically (orange arrow). I did both. Then click the circle by "Fit to" indicated by the green arrow. The blue arrow shows where you can now decide how many pages to print on. I entered in 2 by 2 pages. This is a fairly easy but imprecise enlargement process since we all can pretty much visualize the size of multiple sheets of standard paper. If you can't, pull out a few blank sheets and lay them out side by side to get a feel for how many pages you need. See the difference in the grey 'preview document'? Click OK.
You can preview before you print. 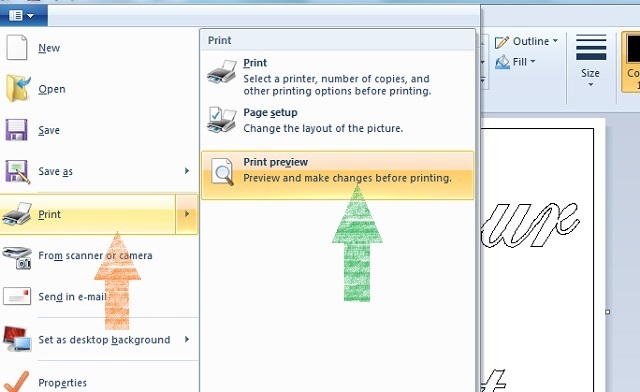 The arrows above show you at the print menu again, but selecting 'Print preview'. I didn't get a shot of this, but Paint will show you the individual pages that it is going to print. It would be helpful if it showed all the pages at once, but it doesn't. If you don't like what you see, go back and adjust things, resize, whatever. This a previous version, without the rectangle around the words. Then you will get your lovely large sets of letters/text. My example just happened to print each word out on it's own complete sheet of paper. That's what works best for making the pattern, fewer pages to tape and lines to match up. But, ideally to better show you this technique, I would have had some letters cut between pages. With Paint, you are likely to get some pixelation of the lines. It's nothing that going over the lines with pencil or pen won't cure. Again, not ideal, but cheap and easy. Then you tape the pages together. You can see in the image above where I cut away the margin where the box crossed from one page to another so I could tape it precisely. Sometimes it will be off a smidge and you just adjust accordingly. So there you go. A quick and easy way to get larger phrases really big using Word and Paint. BTW, other things can be enlarged this way, not just text. 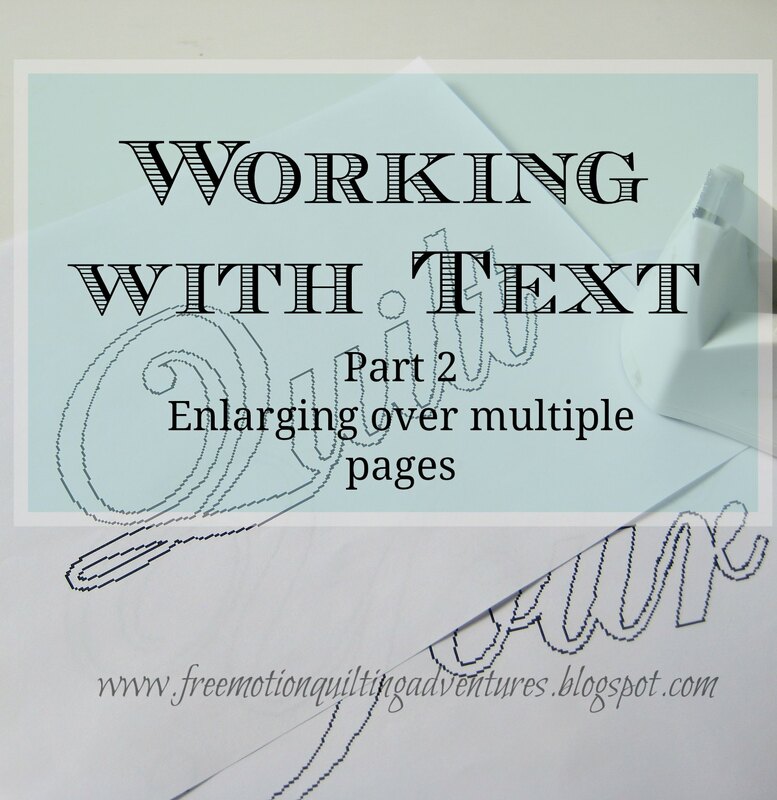 Upcoming parts of this series will be using a graphics program to enlarge words in a specific area to a particular dimension and various ways to transfer the text to your quilt. Today, I'm sharing with you the wisdom, humor, and awesome writing skills of my friend Robin. To understand part of her wisdom, though she calls herself foolish, you will need to know that the Marvy Marker is one of those purple air-erase markers which can disappear quickly. 4A wise quilter nappeth not. 6A wise quilter knoweth it is vanity. 6A foolish quilter alloweth two hours to worketh with a ruler. 9A wise quilter marketh 5 or 6 blocks. 11A foolish quilter blabbeth to her daughter while using a ruler. 13A wise quilter marketh with chalk. 15A foolish quilter knoweth not and followeth Satan into darkness. Give your compliments to Robin in the comments please? She's an excellent writer and funny as all get out. I'm hoping she will share with us again. Our quilting theologies do vary somewhat as she's a longarmer and clearly has ruler issues, but I won't hold it against her! One of my passions in free motion quilting is doing ruler work. 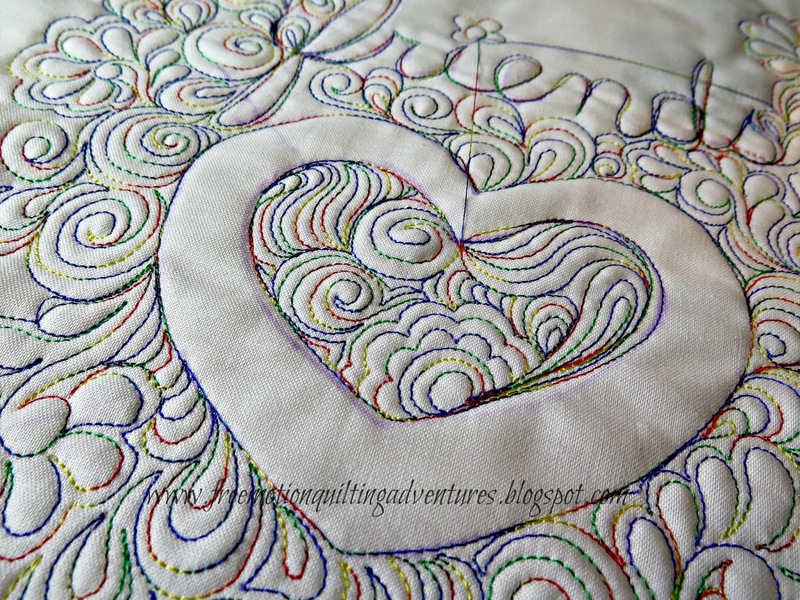 As I've posted before, the right foot for making these smooth lines and curves while quilting with long arm rulers and templates is an absolute must. This is a bit of an out-of-the-box technique right now, which takes a creative solution. To use a regular free motion foot with long arm rulers/templates is to risk the ruler hopping over or under the foot, resulting in a broken needle at best, or a broken needle and a machine with the timing gone awry. It can be done, but isn't recommended. In fact, even though I first put a ruler toe from the Janome Frame Quilting Foot Set (for the Janome 1600) on the Janome Convertible Free Motion Quilting Foot Set (High Shank) for my Janome 6600P nearly 3 years ago, it wasn't until recently that Janome gave me the thumbs up on the use of the toe this way. Anyone with a Janome machine should be able to use the ruler toe on a Convertible Free Motion Foot Set for their particular machine. 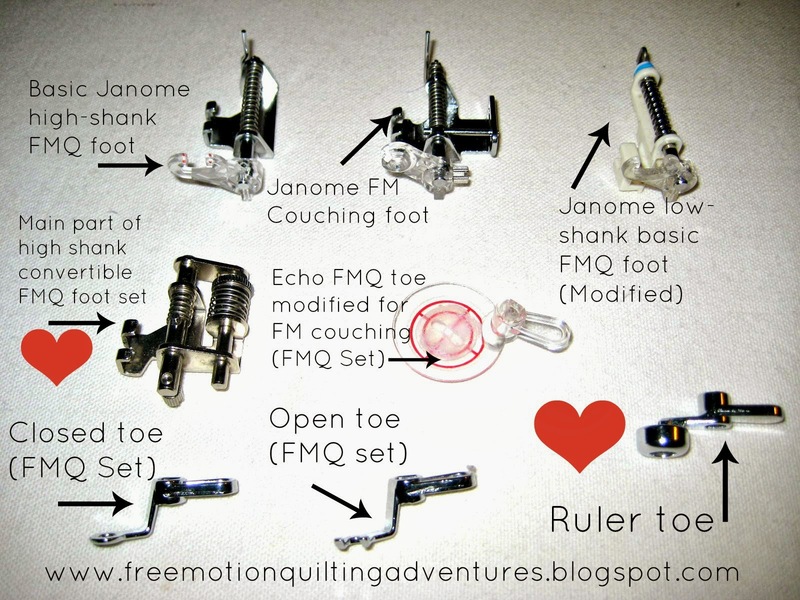 Some of the lower end machines may not be specifically listed, but should still be able to use the Janome Convertible Free Motion Quilting Foot Set for Low Shank Models . The product links in the above 2 paragraphs are Amazon Affiliate links, which may provide me with some pocket change should you order something from Amazon after clicking them. This costs you nothing and helps compensate me for all the time I put into this blog. Juki has a hopping style ruler foot available on Ebay. Finishing Touches also has a ruler toe for Juki and a few other machines. Most sit-down long arm machines should have a ruler foot available or be able to use the feet available from Finishing Touches. 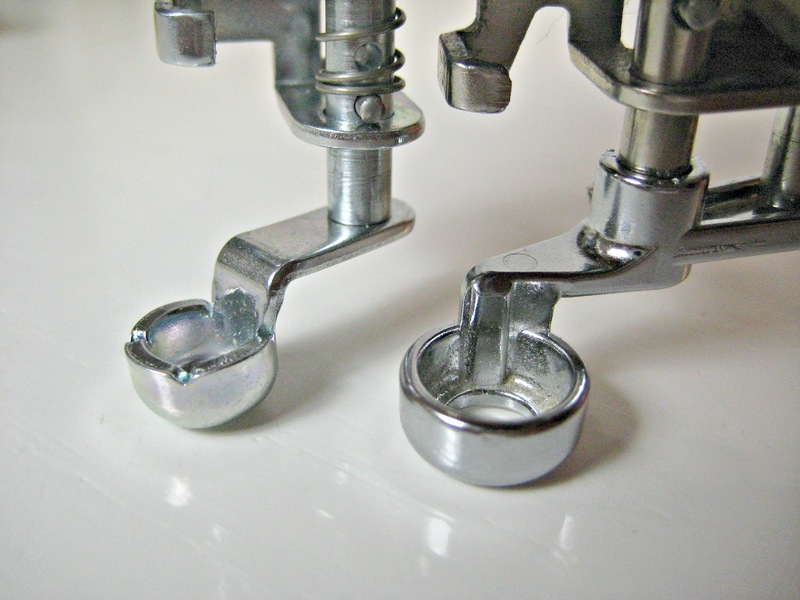 Reneah has given us a fabulous tutorial on fitting the Janome ruler toe to a Bernina. And finally, a reader had given me a heads-up on a new source for a ruler foot that she found at Fall Quilt Market. This new company bills their foot as available to fit nearly every model of machine and makes a version to fit the Bernina Shank Adapter. 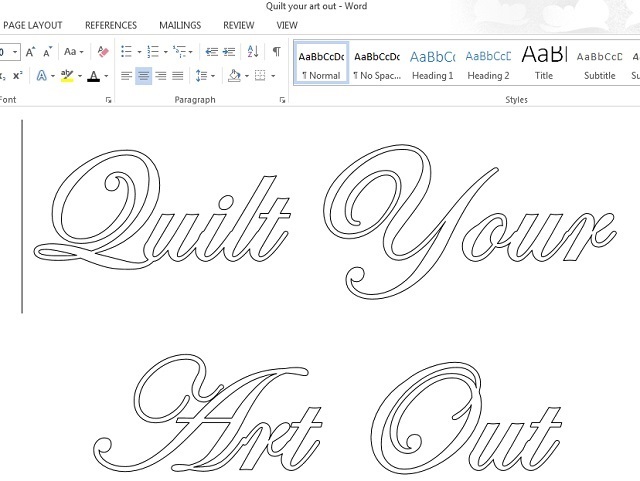 I happen to have one sent to me by another reader and the creator of the Top Anchor Quilting Templates. I am a Janome user. 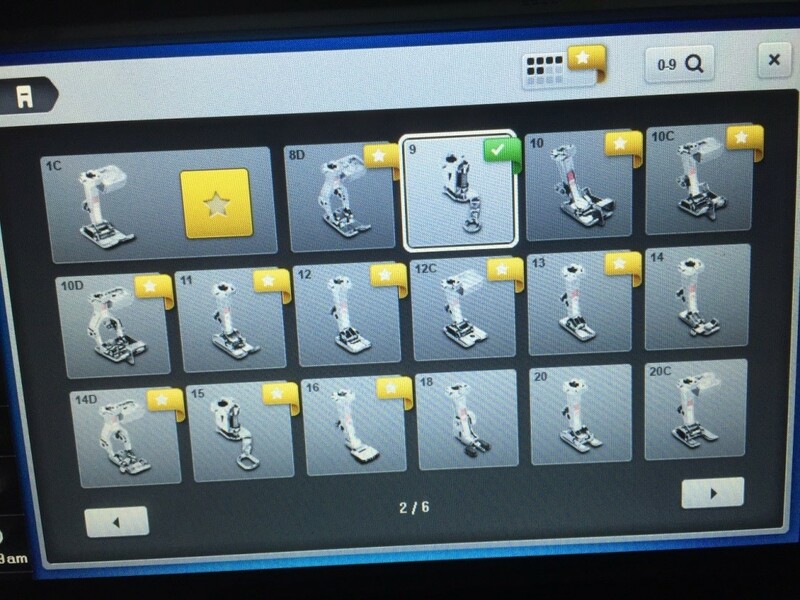 I have no access to the majority of machines available to test these feet to see what does or does not work. As I stated in the first paragraph of this post, it's a bit out-of-the-box. I am doing my best to let you know of suitable feet as I come across them, but I cannot assume responsibility for your results on your machine. I think for the most part, my readers understand this. So this new foot comes from all the way across the pond in the UK. It is called the Parrs Reel Ruler. It was not designed particularly to use with long arm rulers and templates as I have shown here, but instead to use with their own ruler system. I am not particularly interested in their rulers, just the foot. The company has a wonderful series of videos on their site to see the rulers and foot in action. Check them out. The foot that was sent to me also came with one of their rulers and I believe I have been spoiled by the thick, high quality rulers and templates made from 1/4 inch thick acrylic here in the states. The Parrs Ruler was thin and very lightweight in comparison, made from clear plastic. I was surprised to see they were only 1/8 inch thick. One drawback to their system is the need to 'break' (cut) thread to reposition the ruler away from the line of stitching. 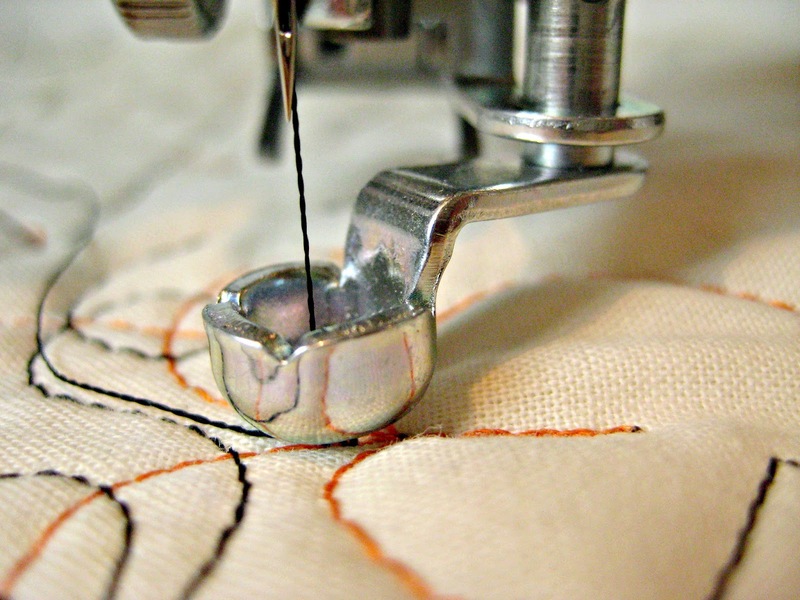 You are to use the groove in the center of the ruler to guide your stitches. So the foot: It is a hopping style foot, which means it's a bit noisy, and in the down position presses pretty far down on the bed of the machine. As it hops, it does clear the quilt fine. At least on my machine it did. 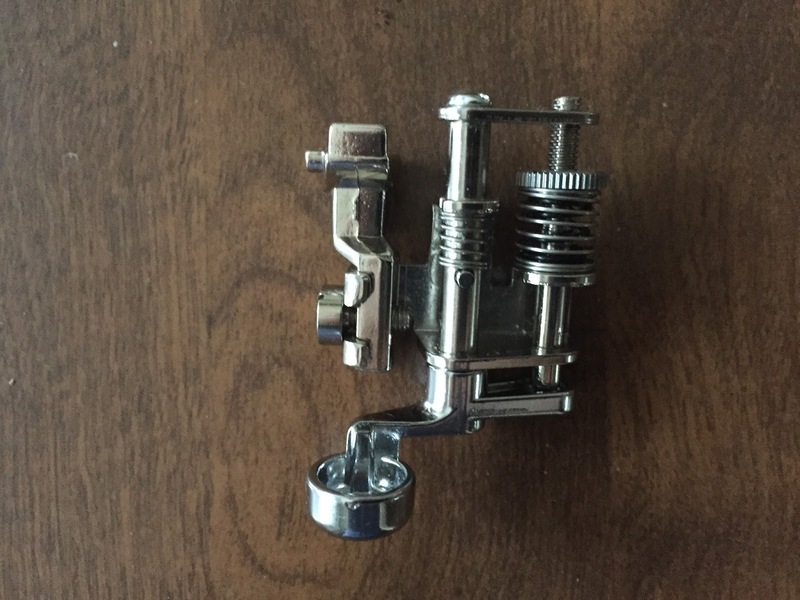 Betty, who sent me the foot she bought for her machine, a high shank vintage Singer, said the foot didn't allow room for the quilt to move under the foot. This is the clearance in the high position. There are directions included to bend the bar over the needle bar and adjust the position somewhat. Here's one big draw back: The ruler foot is smaller than most, as it's made to ride snuggly in the center groove of their rulers. This means you can't use their rulers with a standard 1/2 inch diameter ruler toe. It will not allow for the precise 1/4 or 1/2 inch spacing using lines on a standard long arm ruler. The Parrs Reel Ruler that came with the foot seemed to have adjusted the ruler lines to accommodate this variance. You also can't use this root on any rulers or templates that need a 1/2 inch foot for proper spacing as in TopAnchor's rotating templates or Quilter's Groove ProLine rulers. The smaller size of the ruler foot gives me a bit of worry as there is a bit of play (wiggle) to the foot in its shaft. I did have to move my needle position to the left a few spots to get it closer to the center of the foot. This did leave my needle a bit front of center and I was worried that pressure from a ruler could lead to a broken needle on this foot, so in my "test drive" I didn't use a ruler positioned against the front of the foot. Given that this particular foot was not bought/fitted for my machine (but for Betty's), I can't say that this is a flaw on their part. Though if the foot was a standard 1/2 inch in diameter, there would be plenty of room around the needle. The foot has excellent clearance for a ruler all the way around the foot. In fact, it has better clearance in one spot than the Janome ruler toe combination. Even though their rulers are thin, the sides of the ruler foot are sufficiently high to keep rulers from sliding over or under the foot. Their website states that they can adapt the foot to a variety of machines, including Janome. The options given are for low reach, high reach, or Bernina machines. I assume that reach is equivalent to shank. I would definitely contact them to make sure the foot would fit before ordering as the order form gives no other fit options than those three options. The video shows the foot on what looks like a Janome. The cost is pretty high, but you also get the #1 ruler and a Sew Slip mat (similar to the Supreme Slider). It has to be shipped from the UK, though they seem to be working on setting up a US distributor. I will post a video review of the foot as soon as possible. Edited to add: I totally forgot to post the video for 4 months. 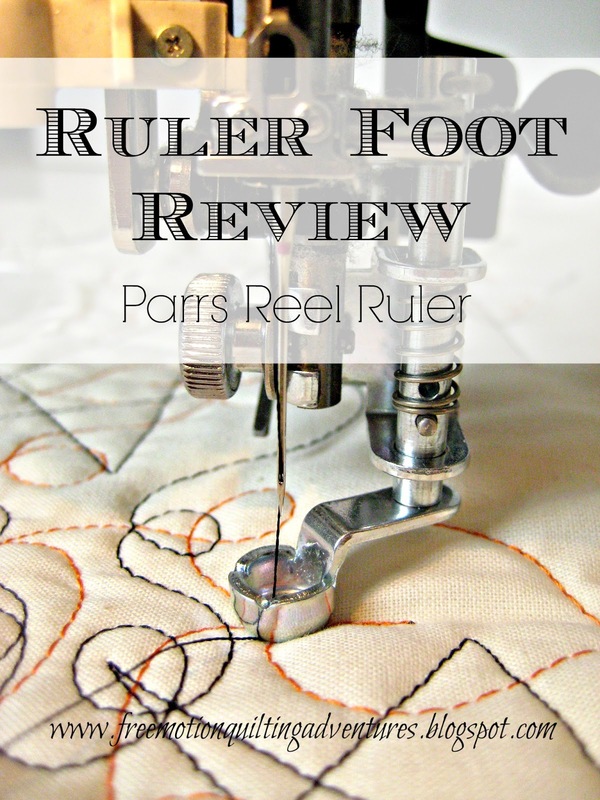 You can see it now at Parrs Reel Ruler Foot Review. My verdict? If you have yet to find a ruler foot for your machine, or live overseas and shipping from the states is cost prohibitive, you might want to try the Pars Reel Ruler foot. With it's smaller 'foot print' and slight wiggle to the shaft I can't recommend it over a Janome foot if you are trying to make that choice. If they ever change their design to 1/2 inch diameter (unlikely since they'd also have to change their rulers), I might be tempted to choose it over the Janome foot, despite the hopping, for the 360 degree clearance and better view around the foot. Would I really want both? Not at the current prices for either. I mentioned last week that my oldest child had been sick. The other kids and I have been hit with various levels of winter yuck, but thankfully none of us required a trip to the doctor. Last week I was in denial as I prepared for 2 days at the shop working for our Christmas open house. A box of 'candy' for a thread obsessed quilter! One of the new things we got into the shop in time for the event was Glide thread. I am so tickled to now have a source of this yummy thread so close to hand. (Hmmm...guess whose idea it was to get carry this thread?) Opening the box reminded me of getting one of those Whitman chocolate boxes; there was a foam sheet over the entire box, keeping each color snuggled in its place. Yesterday, I finally admitted defeat and so began a nice lazy day of rest, trying to make the best of feeling yucky. I got out a few magazines that I had bought and hadn't had a chance to read. Mainly, I drooled over the pictures of the award winning quilts in the magazine for AQS. So much beautiful quilty goodness! I also downloaded the Craftsy app so I could watch my latest classes on my Android tablet while lazing about in bed. I bought 2 machine embroidery classes as I need to demo the embroidery machines at the shop. I want to be as prepared as possible. When lazing about made me feel just outright lazy, I puttered about in my sewing space. I rearranged it recently to try to take better advantage of the natural light. I'm still not sure I'm ready to show you much of it. Look at all that light! I'm hoping this new set up will allow me to get better pictures and videos to share with you. Looking at my pictures, I feel like I ought to 'prettify' my studio. That's what some down-time gets you- even more project ideas! I hope you've been having a good weekend and are healthy and hopefully doing something quilty! Now, there's a bed calling my name! 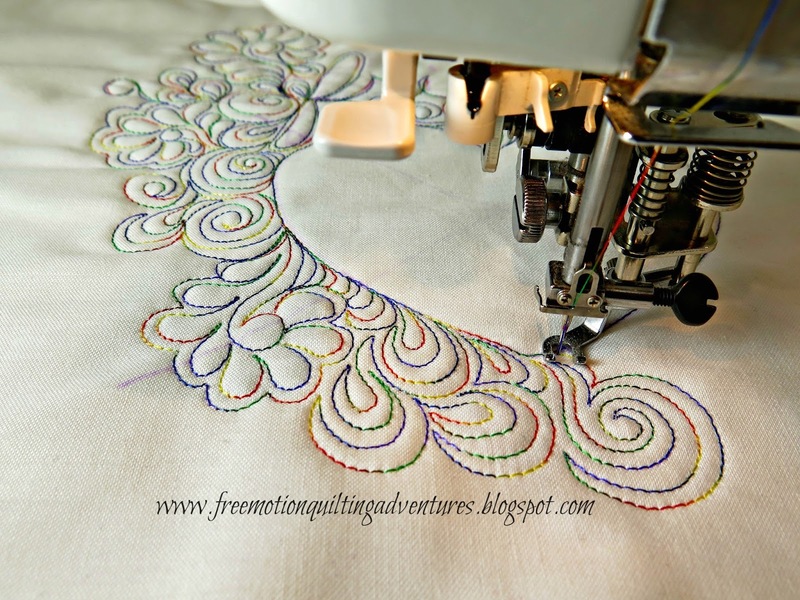 I shared my technique of combining the ruler toe from the Janome Convertible Free Motion Frame Quilting Foot Set with the Janome Convertible Free Motion Quilting Foot Set more than two years ago in this post on Quilting Tools. It was quickly followed up by my most popular post ever, Quilting with Rulers on a Domestic Sewing Machine. 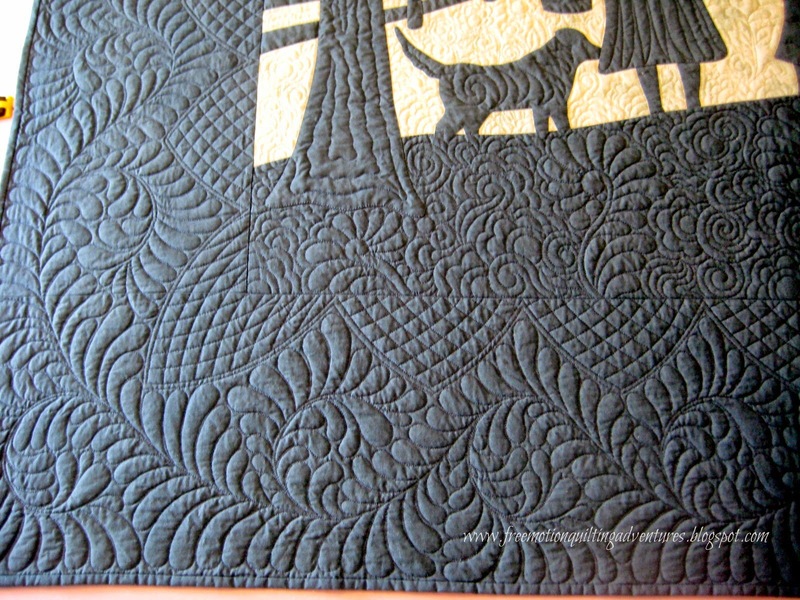 It's been such a great technique for achieving smooth lines and curves when free motion quilting. 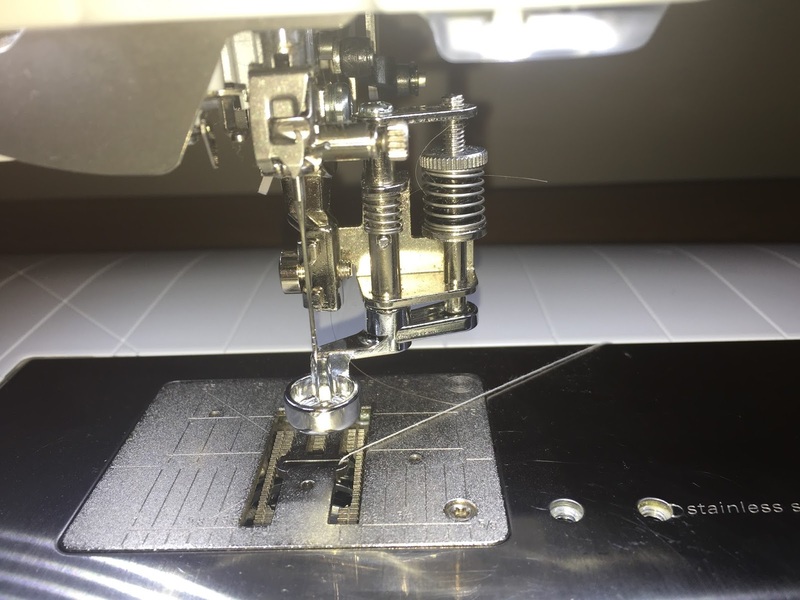 Since it involves Janome feet, Bernina owners (and other who can't use the Janome feet) have been so eager to find a way to use this foot or an equivalent foot. 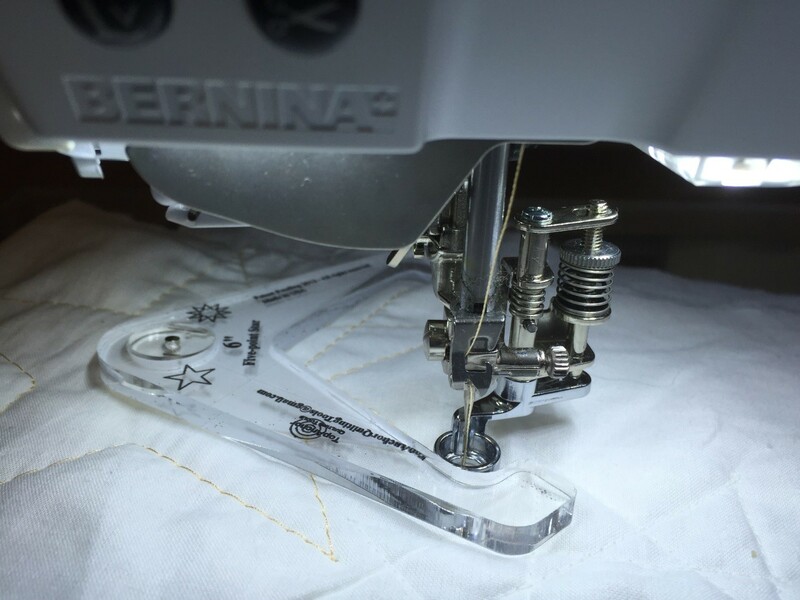 Through my work with Top Anchor Quilting Tools, Betty Bland put me into contact with Reneah Rafferty, a Bernina Educator who has made the following tutorial to use the Janome foot on Berninas! Yay! I know we've had a few creative souls who have tried to make it work before, and I admit wishing I had tried harder to figure it out before now, but I am a Janome girl, so I would not have figured out that the compatibility issue could be fixed with the computer settings. Update: Looks like the new Bernina long arm machine will have interchangeable feet with the domestic Berninas, including the ruler foot. 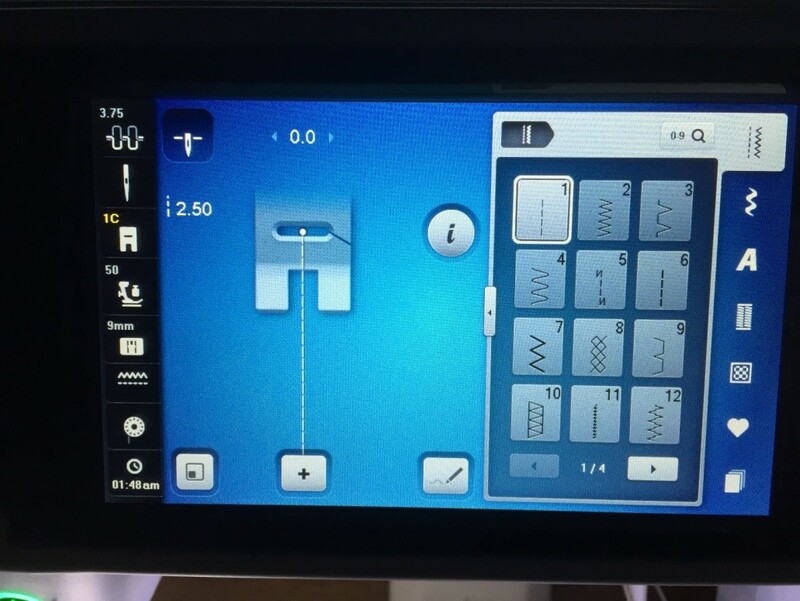 Though there may be some software updates needed to use the long arm's ruler foot on a regular Bernina or some creative settings adjustment, like Reneah has done below. I have no idea when the long arm's feet will be available for purchase, especially separately from the long arm. we just keep getting closer to having ruler feet for everybody! Update to the Update: Since the thickness of any ruler foot can cause the top of the needle bar/clamp to hit the top of the ruler foot, ALWAYS put the foot in the lowered position before lowering the needle! 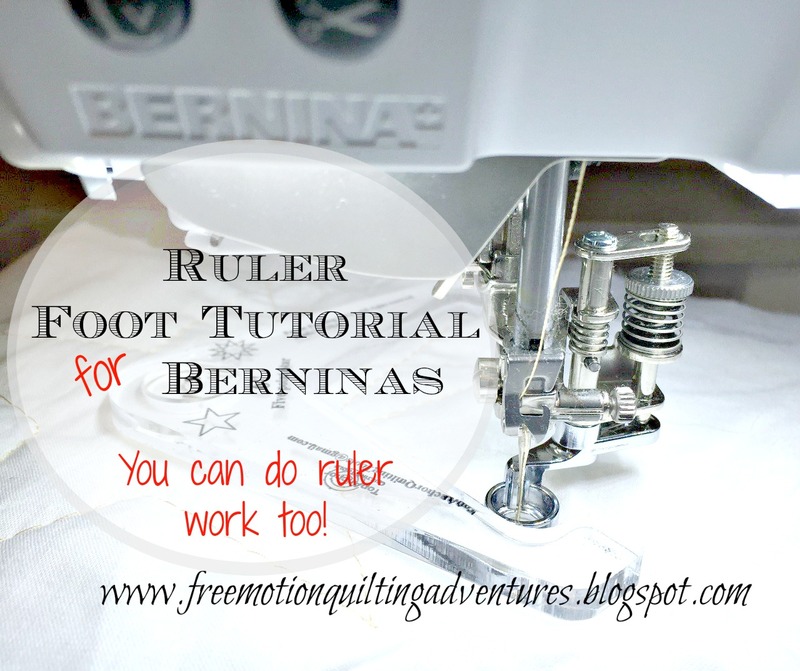 This applies to all ruler feet and machines at this writing (8/4/15) and is the reason why Bernina is not recommending the use of their new ruler foot for the long arm to be used on the regular Bernina machines. In my opinion, this isn't a big issue as long as you can discipline yourself to lower the foot before lowering the needle. She did this tute with her Bernina 880 and promises to check other machine going forward from here. Many thanks to Reneah and Bernina for this information. The following are the steps I needed to do to set my Bernina 880 for quilting ruler work. The following feet and accessories are needed. 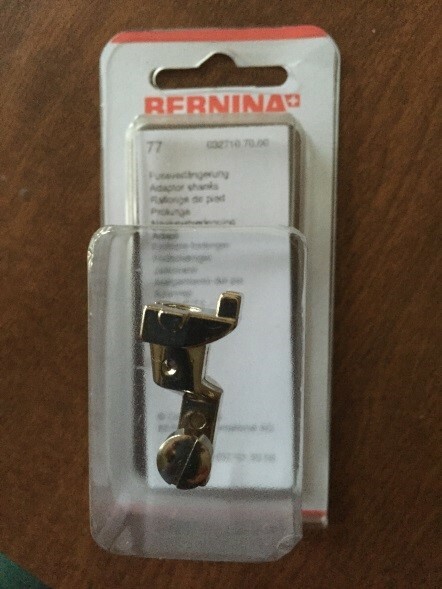 Step 1: Purchase the Bernina 77 foot which allows you to add another company’s shank and use that companies specialty feet. Step 2: For the Bernina 880, I will be using the below, Janome Convertible Free Motion Quilt Foot Set for HIGH SHANK. This can be purchased at your local Janome Dealer. The Janome Convertible Free Motion Shank I like because there is a spring to the right and screw that allows you adjust the height of the foot or the distance from the foot to the quilt. 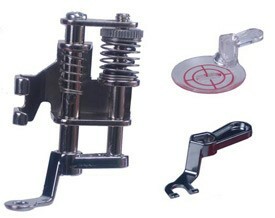 Step 3: Also, from a Janome Dealer you will need to purchase the Convertible Free Motion Frame Quilting Feet for 1600. These optional feet can be used with the Convertible Free Motion Quilt Shank. The ruler toe foot is a perfect height for the ¼” rulers. It actually looks like a hopping foot that the long arm machines have. With most domestic home sewing machines, the free motion foot is thin and you have to worry about the foot sliding under the ruler or template and possibly breaking a needle. Per the instructions on the package attach the ¼ inch ruler foot to the Janome Convertible Free Motion Quilt Shank. Step 4: Attach the Convertible Free Motion Quilt Shank to the Bernina 77 Adapter. Step 5: Attach the Bernina foot 77 to the machine. If your machine is in a cabinet, drop the machine down so it is flush within the cabinet or use the tray that came with the machine. Supreme Slider-When you are doing free motion quilting there is a lot of strain on your arms and shoulders to push and pull the quilt under the machine. In order to help the quilt move easily, I use the Supreme Slider on the machine. A Supreme Slider is made of 100% Teflon which is very slippery and allows the fabric move smoothly. This is important for domestic sewing machines. Place the white side up. The following are the settings that I found that would work with my Bernina 880 machine. Each machine may be slightly different, but this will give you starting point or a guide to start by. 1. Select stitch number 1 in the Practical Stitches. It will be necessary to trick the machine to think we have a different foot on the machine. Press the foot icon on the left of the screen. As shown in the next picture, it is 1C. 3. Select the, the darning which foot 9. 5. If you would like, you can lower the feed dogs. Personally, I leave them up but adjust the stitch length to zero. The zero stitch length keeps the tension in tack but doesn’t allow the fabric to move. Much like having the feed dogs down. This will be an individual preference. 6. The needle position will need to be moved over to the right so that the needle is in the center of the ruler foot. Press the right arrow button on the machine for the needle position 5 times. It will show as the below with the 9 foot. 7. Presser foot pressure will need to be adjusted. 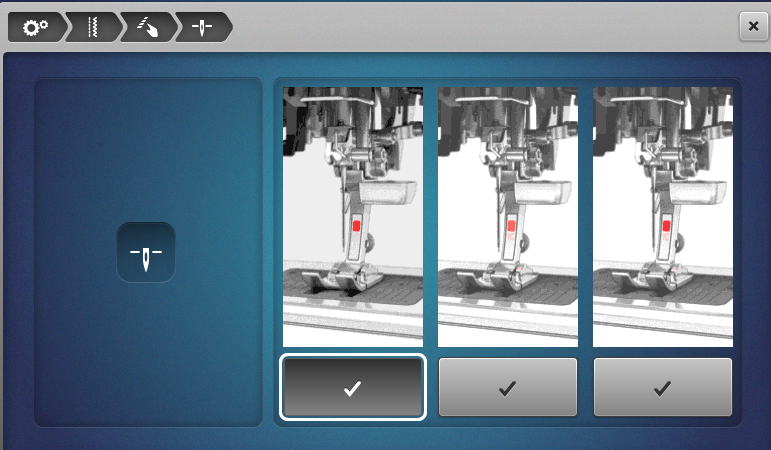 With the machine default settings, the foot will press on the fabric not allowing it to move freely. This setting is one that will not be set in stone and is an individual setting depending on the thickness of the quilt and your machine. I am working with muslin on the top and bottom with Warm and Natural batting. 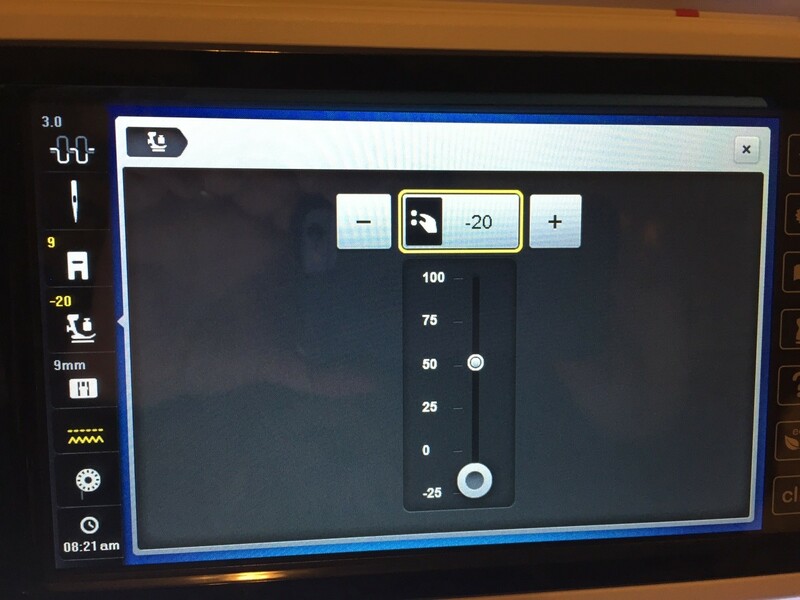 Press the Pressure foot icon on the machine. Press the “–“ sign until you reach at least a -20. Depending on your project thickness, you may need to go to -25 and also adjust the screw on the Janome foot so that the foot just lightly touches the fabric. On a scrap piece of quilt sandwich, test to make sure that the fabric moves freely under the foot when free motion quilting. You don’t want the foot too high. This will cause the fabric to flag and you may experience skip stitches. 8. The last setting that needs to be made to the machine is the deactivating the hover feature when the needle is in the down position. 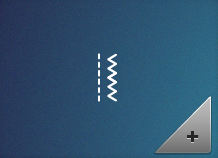 Press the setup icon on the right toolbar. 9. 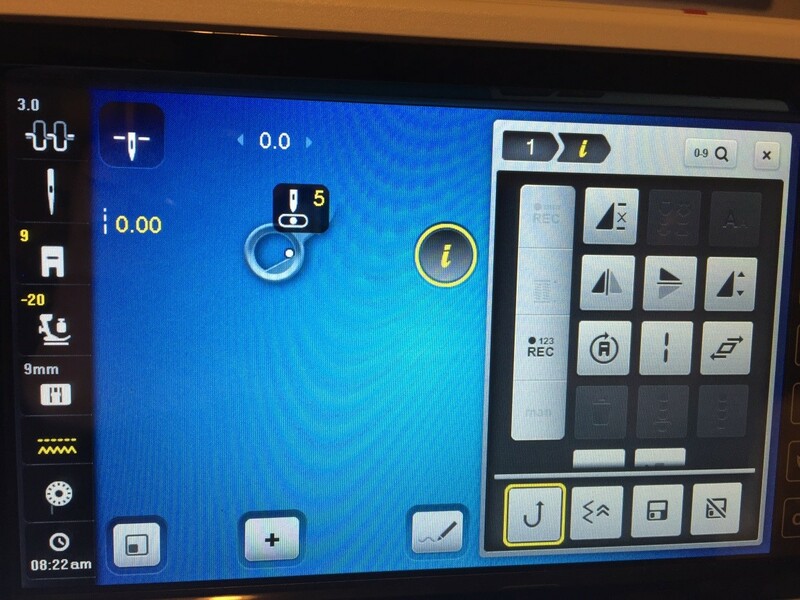 Press the plus on the Sewing Settings icon. 10. Press the plus on the Programming Function-button/Function icon. 11. Press the plus for the Press Foot Position with Needle Stop Down icon. 12. Press the first option that will not allow the foot to rise when you are not sewing and the needle is in the down position. 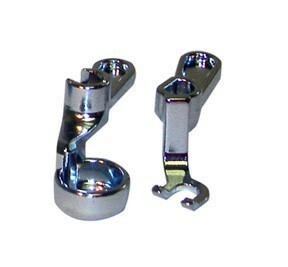 Remember we adjusted the pressure foot pressure in a previous step with the Janome foot shank adapter. The foot will be raised slightly in this position. There it is folks! I hope this helps you to set up a ruler foot for your machine. This may not work exactly the same across all models but should be fairly similar. Leave Reneah questions in the comments and I'll do my best to get her to answer them. She reads this blog, so she may answer directly.